The Bixby home page on your Samsung Galaxy S8 is all about getting you summaries of the information you want to see the most in the most efficient way for you. The Bixby home page gives you summaries of information from a variety of different apps. Each summary is called a Bixby card. Press the Bixby button on the left side of the phone twice. Swipe to the right from the Home screen. 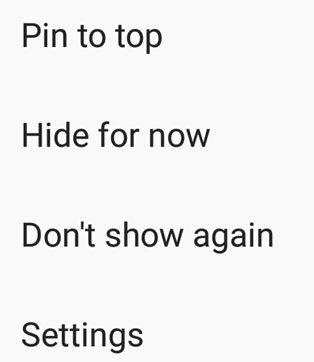 Take either of these actions and you see the Bixby home page, shown here. You can have as many or as few cards as you want on the Bixby home page. You can see all the options for setting up cards by tapping the Hello Bixby Settings icon, shown in the upper-right corner. This brings up the list of Bixby-supported apps. 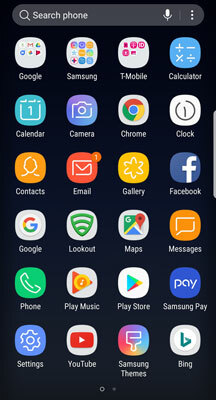 When you tap supported apps, you can see all the apps that you could potentially put on your Bixby page. This includes apps you’ve already downloaded, as well as apps that you may want to download. This list will continue to change as more apps support the Bixby card. If you see an app is supported, but you haven’t downloaded it yet, simply tap the Download button, and you’ll be taken to the page within the Google Play Store so you can add it immediately. The apps supported by Bixby. 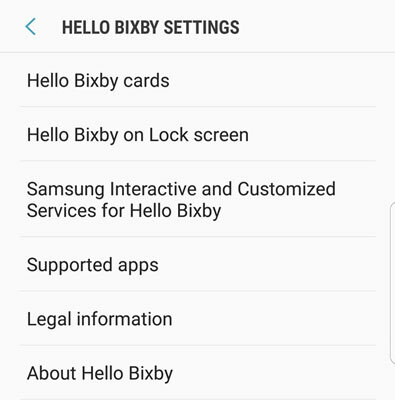 You add a card for this application by tapping the Hello Bixby Cards link on the Bixby Settings page. This will bring up the page shown here. If the toggle switch is to the right and shows blue, it means there is a card for it on the Bixby home page. If the switch is to the left, this app does not have a card on the Bixby home page. If you want to add it, you simply slide the switch to the right. If you want to delete the card, you simply slide the switch to the left. 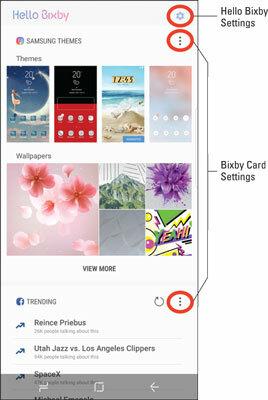 The following figure shows the Bixby home page in panorama if you tap the toggle to have all apps have cards on the Bixby home page. When all apps have active Bixby cards. You have some flexibility in the placement of the cards. Each card has three vertical dots in the upper-right corner. When you tap these dots, you get the pop-up shown here. 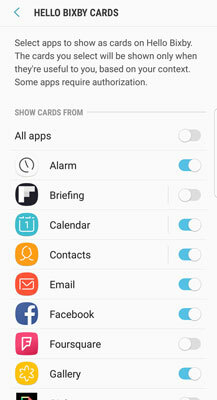 Display options for each Bixby card. If you’re particularly interested in one card, you can tap Pin to Top. This will move that card to the top of the list. You can also choose to hide a given card or remove it from the Bixby page. The Bixby page is very handy when you’re actively using your phone. You can also see Bixby cards when the lock screen is active. If you’re simply looking for the temperature, the score of the game, or if a message has arrived, and it’s inconvenient or inappropriate to unlock your phone, you’re in luck. Back in the Bixby Settings screen, tap Hello Bixby on Lock Screen. Choose the cards that you want to be able to see without unlocking your phone. When you press the Bixby button twice, you’ll see the information on the selected cards and nothing for the cards that were not selected on the screen. Bixby cards when the phone is unlocked and locked. 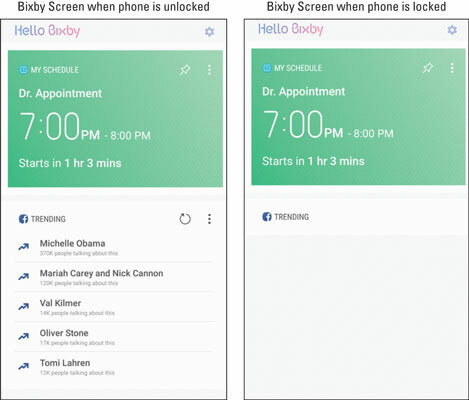 The left image is what you see when the phone is unlocked and select Bixby. In this case, you see the cards for the calendar and Facebook. The right image is what you see if you press the Bixby button when the phone is locked. In this case, you can see an upcoming appointment, but nothing about Facebook. It’s entirely up to you what cards you see and when.